"That painting looks sooooo good!!!!! I can't stop looking at it and it just seems like Buddha is about to come over and lick me! He is perfect! Monroe is toooooo cute...looks just like him!!!!! It looks FANTASTIC!!!!! I love it!!!!!" "I could not have been more pleased with the portrait of my three "kids". I have dubbed the portrait, the "Three Amigos". Everyone that has seen this portrait can't stop saying how lifelike they all look and especially Buddha's expression! He looks exactly like himself! We all just expect him to jump off the canvas and lick us to death. This portrait also became a Christmas card that I sent out. You did a fantastic job and I'm looking forward to hiring you for my horse's portrait!" 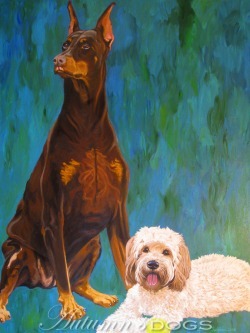 "The painting of my two dogs, Spot & Barney, was the greatest gift I have ever given my wife. She said, "This is the best birthday present I have ever received." Thanks so much as I hope to have some other customers for you!" "My husband loved the piece. We both think you are so talented. It looks exactly like him. I've told a number of friends about you and hopefully you will get some business from them. ... I LOVE IT!" "Thanks, Autumn, he looks great! I especially like the paws!" "The day we received our portrait of our 2 dogs delivered by Autumn (on Christmas Eve I must add) we were so amazed how realistic our 2 furry family members appeared. I still cannot get over the attention to detail she was able to capture from a photo. A testament to this, my Doberman came around the corner, saw it against the wall and started growling at it, her hair stood up on her back. She must of thought it was a dog burglar. 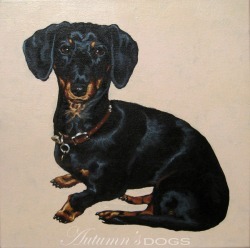 Thank you Autumn, we love it and everyone that has seen it has expressed the same." "I just wanted to tell you how much I love the painting. You got my girls spot on! The level of detail is pretty amazing. You are a very talented artist and I appreciate all of the time and effort that you obviously put into the painting. It is the best birthday present that I have ever received! We already have it hung up at home and it makes me smile every time I look at it! Thank you again!" "Thanks for Max's portrait. You're such an incredible painter, Autumn!!! You captured his personality and spirit." "AWESOME! A stunning portrait of Max! Thanks again--you're so freakin' talented!!! :)"
"We have your painting of Max on our wall and we both say how talented you are every time we look at it." "All I can say is "WOW!" This looks just like Copper. I love it and I know you will make Courtney cry!" "Courtney LOVED the drawings! She actually cried when she first saw them and her husband can not stop thanking me for them. We were over at their house a couple of days ago and they are displayed beautifully in their living room." "Oh, wow! That drawing is so awesome!! It captures them really well."